What happens about the Settlements? Q: What happens about the Settlements? 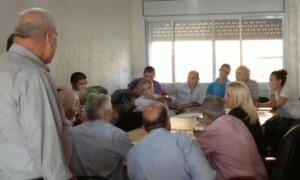 UPDATE: on July 14, two dozen activists from Haifa in Israel went to Ramallah to meet their newly formed counterparts in the West Bank (pictured above). They all agreed to adopt the Munich Declaration of One Democratic State as a uniting platform. In contrast to the official “peace negotiations”, they say that they met “not as two sides but as partners in the same struggle for a common future”.